Hanoi is the capital of my country Vietnam. One of our proud about this land is its long history of over 1,000 years. In 1010, the king Ly Cong Uan moved the capital to Thang Long from Hoa Lu (now in Ninh Binh Province). Since then, together with ups and downs in our country’s history, Vietnam’s capital moved to some other places for certain periods, e.g. in Ho dynasty (Thanh Hoa), Nguyen dynasty (Hue). 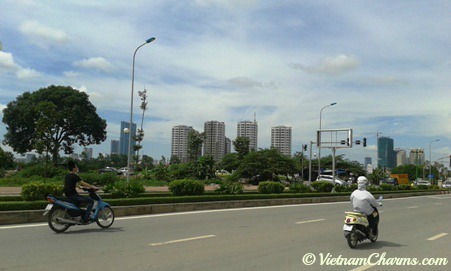 From 1945, Ha Noi regained the title of the capital of Vietnam. Lying beside the Red River in the north, it is the second largest city in my country. It’s about 100 kilometers (62 miles) from where I’m living, Haiphong port city. As of 2012, population of the capital is about 7.1 million, living on an area of 3,345 km² (1,291 sq miles). If you visit our capital the first time, you will likely feel the chaos of the traffic and living pace here. Foreigners are usually unfamiliar with numerous of motorbikes making sea of roaring engines and beeping horns. But looking further, you’ll feel a land of old-world Asian charm, with verdant public parks, numerous scenic lakes, and wide tree-lined streets shading old French colonial-style villas. From other Vietnam cities and towns, people go to Hanoi by train, bus, car, or air plane. Foreigners usually go to the city by catching fights to Noi Bai international airport. From the airport, visitors go to city center by taxi (cab), bus, or a car rented (with a driver) at the airport. It’s about 32 km (20 mi). There’s no subway or highway available. The 36 ancient streets may bring well an image of Vietnam in the past. It’s really a charming destination for foreign tourists. Here, all street’s names include a word Hàng (Goods) and names of the goods sold on this street. In the old day, each street sold one traditional product. For instance, Hàng Lược (Comb Street) sold comb, Hàng Gà (Chicken Street) sold poultry, etc. Now, things changed. On many streets people sell different goods besides traditional products, many of them are even not relating to the street name. This is a busy commercial and sightseeing area of Hanoi. The real estate there is the most expensive in Vietnam. For example, according to TalkVietnam.com, landowners can sell their land for as much as VND500-700 million ($23,809-33,333) per square meter. It’s an exorbitant and somewhat ridiculous price; given the fact that Vietnam GDP per capita is about $1,400 as of 2012. Frankly, I’m not interesting the idea of living in this area. It’s overcrowded and not comfortable at all. The lake is located in the heart of the capital. It’s not very large, but peaceful and beautiful with quiet Turtle Tower right in the lake’s center. To Vietnamese and foreign friends, Hoan Kiem Lake is the symbol of Hanoi. Hoan Kiem Lake has an interesting historical legend, in which our national hero Le Loi returned magic sword to the Golden Turtle God after he won the war against Minh enemy from northern nation China. Nowadays, there’re a few very old turtles still living in the lake. They surface several times a year. They’re estimated hundreds of year old and respectfully called as Great Grand Father Turtle (Cụ Rùa), or Sacred Turtle by Vietnamese. Sadly, you may notice that this landmark is now in pollution as people threw all sorts of rubbish into it, including bricks, concrete, plastic bags and raw sewage. The capital city is trying to clean the water by many efforts; hopefully it works. Besides Hoan Kiem, Ha Noi also has many other lakes dotted among the city, including Ho Tay (West Lake), Ho Thien Quang (Halais Lake), Ho Bay Mau, etc. Ho Chi Minh Mausoleum (Bảo tàng Hồ Chí Minh)- the place holds the embalmed remains of Uncle Ho, as we Vietnamese affectionately call our late founding president Ho Chi Minh. One Pillar Pagoda (Chùa một cột)- as it name suggests, the pagoda has only of one pillar shouldering the structure. Temple of Literature (Văn Miếu) - used to be the learning center, and we consider it the first university in Vietnam. If you’re interested in history, Confucianism, or iconic traditional architecture, the temple is definitely a grace place to visit. It’s a quiet spot in the bustling urban, and gives a nice perspective on the cultural background of Vietnam. Bat Trang Ceramics (Làng gốm Bát Tràng)- traditional profession village with well-known prestige on ceramic products. Hoa Lo Prison - French colonists built to detain Vietnamese patriots. They aimed to suppress revolution movement in my country as well as in the whole Indochina. Read more about Hoa Lo Prison. What can travelers do at night in the city? Here’s a list of activities you can do. Note that many all public activities cease after 11 pm. Shopping at night market in Old Quarter and Dong Xuan Market (open in weekend nights only). It’s just over crowded and regretfully that fake goods are all around. Be careful of pickpockets, and traffic safety. For tourists, it’s good to go there once for experience, yet please don’t expect too much. Drinking fresh beer (bia hơi): very attractive habit to locals, many booths serving customers right on pavements. If you want to explore Hanoi, just find a sit drinking beer among Hanoians. Enjoying dinner in Hanoian restaurants like Essence Cafe & Restaurant, Gourmet Corner Restaurant, La Badiane. Watching movies in cinematheques like Megastar Cineplex, National Cinema Center. Apart from above destinations, the city still has many museums, monuments, handicraft stores, etc, waiting for your visit. Altogether, those above fabulous landscapes make up the beauty and charm of the capital city. Having said that, how do you think about our capital? Have you gone there before? If you have enjoyed the sights, share your comments or photos with me and other visitors. We’d love to hear from you! Also, If you like this article, would you mind encouraging me with a Like button? Thank you!